Are you obsessed with Kendra Scott earrings as much as I am?! I’ve been wearing my Signature 2015 Elle Drop Earrings over and over. They go with everything, including this denim jacket outfit I featured. It’s a good idea to have a couple of go-to earrings you can wear with anything and these have definitely become my go-to pair! I was looking for another pair, one that has some color to wear with my summer outfits. 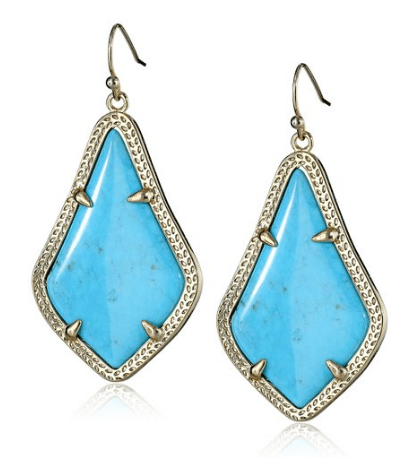 Kendra Scott is fantastic at designing beautiful pieces with stand-out colors. I wanted to share a few I found (and put on my wish list) with you. Get ready for one of the most beautiful jewelry you’ve ever laid your eyes on (cue dramatic music). 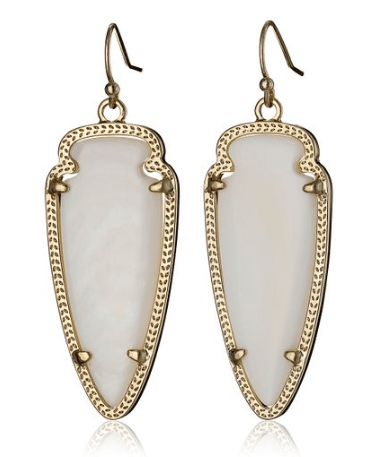 I present to you…..Kendra Scott earrings you really want for your summer outfits. Kendra Scott “Signature 2015” Gold and Maroon Jade Elle Drop Earrings — These come in many different colors, including Seafoam (pictured), Magenta and cobalt. This is a pair of earrings you’ll wear over and over again, just as I do! Kendra Scott “Signature” Alex Gold Teal Color Drop Earrings — These signature drop earrings come in turquoise, teal, slate – just to name a few. All Kendra Scott earrings are handmade and use natural stone. I can picture wearing these with a cute summer shorts outfit. Kendra Scott Signature Dee Gold Magenta Color Drop Earrings — Tear drop earrings are a classic style that are just stunning. The magenta color really stands out. I would wear these with a beautiful summer dress for date night! 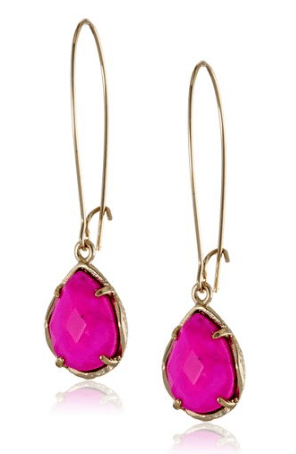 Kendra Scott “Signature” Sky Gold Magenta Color Drop Earrings — Here’s a pair that could easily become your go-to pair. 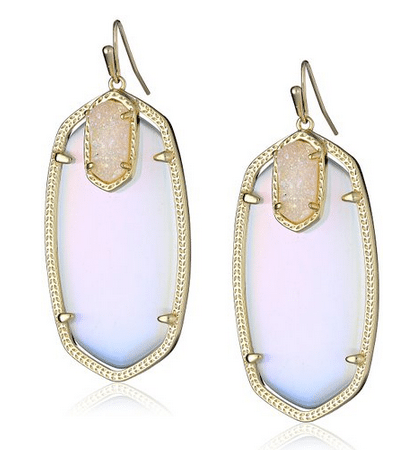 The Mother-of-pearl stone is gorgeous and will compliment outfits from dressy to casual. Kendra Scott “Starstruck” Darcy Gold Stellar Drop Earrings — The small crystal pendant makes these stand out. These are just gorgeous! 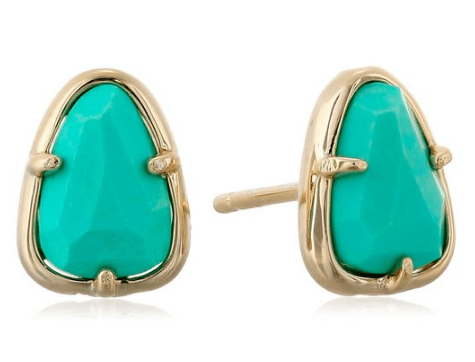 Kendra Scott “Avante Garden” Seafoam Hazel Stud Earrings — Stepping away from the traditional drop earrings, this stud style really makes a statement with its beautiful bold seafoam color. You’ll also find these earrings in white, multi, rose gold…just to name a few. 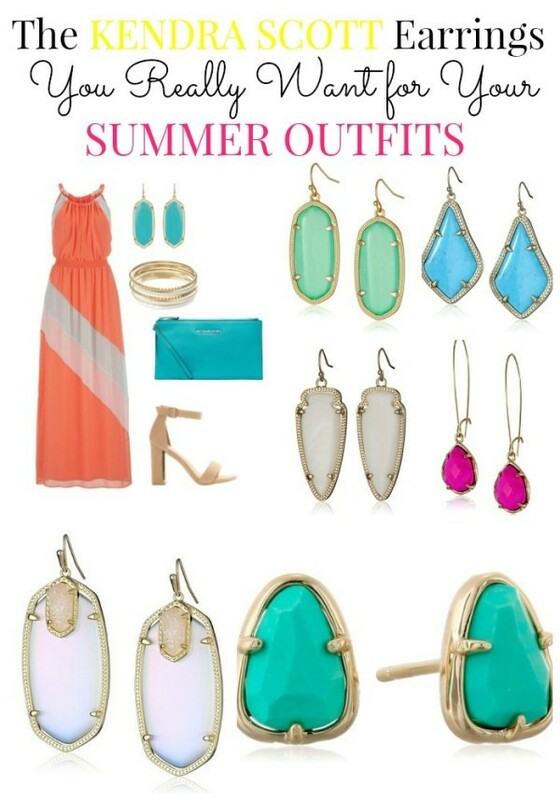 Here’s a summer outfit idea I put together featuring the Kendra Scott Elle Drop Earrings. I love pairing coral and blue together. 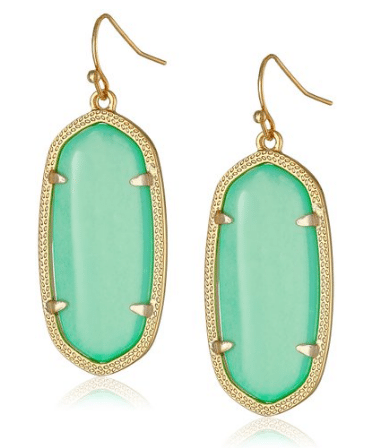 Did you find a pair of Kendra Scott earrings that stood out to you? Like maybe ALL OF THEM. 🙂 Whether you’re purchasing a gift for Mother’s Day, a best friend’s birthday or as a treat for yourself, any of these will look absolutely stunning on you for summer. Previous articleShare Your Motherly Wisdom & Enter to Win Free Shoes for a Year! Next articleKitchen Organization Ideas Part 1: What Kind of Cook Are You? Is it terrible that I want all of those!!! So pretty and I love how you styled them!